After earning an online bachelor’s in project management degree, graduates launch careers in a variety of industries. According to the Project Management Institute, the median salary for U.S. project management professionals in 2015 was $108,200. Project management degrees prepare graduates for roles in diverse workplaces. Project management professionals have plenty of opportunities for advancement and increased earning potential. Embry-Riddle Aeronautical University ranks #1 on The 20 Best Online Bachelor's in Project Management Programs! ERAU, historically known for its aviation and aerospace programs, specializes in degrees relevant to aeronautics industry professionals. The university also offers programs useful to candidates entering related business fields. ERAU students can attend classes online or in-person at over 120 locations worldwide. The university delivers online courses synchronously, so students interact with professors through live communication. Online programs start multiple times throughout the year, giving prospective students flexibility in when they begin their courses of study. ERAU's bachelor's of science in project management degree requires 120 credit hours and typically takes four years to complete. The degree fulfills learning objectives set by the Project Management Institute. Candidates can select a standard bachelor's program or a course of study in which they take master's level courses in their fourth year and then complete their master's degrees in one more year. Students in both tracks learn business and project management best practices and relevant research skills. Some courses focus on the airline industry, such as a specialized statistics course emphasizing aviation applications and a class detailing issues in aviation operations project management, but the skills learned in pursuit of this degree readily apply to other industries. Candidates can apply to this project management online degree program with high school or college transcripts. ERAU publishes clear credit transfer guidelines for students who began their studies elsewhere. The university continues a long tradition of participation with the United States military, and partners with the Department of Defense to offer military personnel tuition assistance. Regis University ranks #2 on The 20 Best Online Bachelor's in Project Management Programs! Regis University offers students more than 131 programs of study at its campus in Denver, Colorado and online. Regis maintains low student-teacher ratios to facilitate meaningful discussions of class topics. In keeping with the Jesuit educational mission of encouraging tenacious questioning of the status quo, Regis also fosters critical thinking skills. Regis helps students develop not only as working professionals, but also as involved citizens and community leaders. Regis offers several specialized undergraduate business degrees, including one that trains future project management professionals. The bachelor's in business with a specialization in project management at Regis requires candidates to complete 120 credits. This degree normally takes four years of full-time study to finish. Classes in this program follow an asynchronous format. Regis offers the program in five-week and eight-week terms, giving professionals options that match their individual schedules. Students who wish to later pursue master's degrees may opt to take up to four graduate-level courses as part of this program, earning undergraduate and graduate credit simultaneously. All students in this program learn accounting fundamentals, basic economics, and business administration. Those choosing to focus on project management topics then gain deeper knowledge about how to design, implement, and assess projects in business settings. Candidates apply with high school or college transcripts, and must show evidence of work history. Regis maintains generous transfer policies, and often gives college credit for military and other professional experience. University of Wisconsin - Stout ranks #3 on The 20 Best Online Bachelor's in Project Management Programs! UW Stout, a career-focused higher educational institution, provides training in business, education, human services, and government office administration. Stout offers more than 71 programs of study on its Menominee campus and online. Part of the respected University of Wisconsin system, Stout stands out for its commitment to the polytechnic educational model, combining liberal arts education and applied learning experiences to prepare graduates for rewarding jobs and community leadership roles. Stout's bachelor's of science in management allows students to choose a project management concentration. This online degree, which follows learning standards set by the Accreditation Council for Business Schools and Programs, requires 120 credits to complete, and normally takes four years of full-time study. Students in this program take general education courses and management core courses that teach accounting, law, and leadership. The management core includes training in online management topics. Students choosing to focus on project management also learn about information systems, supply chains, and quality management. The curriculum culminates with a practicum, where students apply management theories to real-world projects. Candidates apply to this program with high school transcripts showing a GPA of 3.0 or higher and ACT or SAT scores, or college transcripts showing a GPA of at least 2.0. This degree caters to mid-career professionals, as Stout offers credit for relevant work experience. Stout also awards college credit for military training. The university provides scholarships for incoming transfer students, helping those who began their educational pursuits elsewhere to earn degrees through Stout as economically as possible. Liberty University ranks #4 on The 20 Best Online Bachelor's in Project Management Programs! Liberty University, founded as a Baptist educational institution in 1971, now offers more than 550 programs of study at its Lynchburg, Virginia campus and online. The university trains future community leaders, and invests in student academic success with an academic support office that provides subject-specific tutoring and career advisement. Liberty's online classes, delivered in asynchronous format, enable students to work towards degrees whenever their schedules allow. Liberty's bachelor's of science in business administration project management degree teaches candidates to manage time, human capital, and funds to achieve project goals. Students complete 120 credit hours of classes, typically in four years of full-time study. Students receive instruction in core business topics, such as accounting and economics, as well as basic and advanced project management. This Liberty degree stands out from other project management bachelor's degrees online with its emphasis on global project management issues. The degree has earned program accreditation from the Accreditation Council for Business Schools and Programs, which oversees some of the best business-related bachelor's degrees online. Candidates apply with high school or college transcripts. Liberty does not use standardized tests, so candidates do not need to supply ACT or SAT scores. The university maintains clear credit transfer policies that allow students who began their studies at other institutions to complete Liberty degrees in time-efficient ways. Liberty also gives college credit for many types of military training, and offers free credit reviews for candidates with military service experience. Colorado State University - Global Campus ranks #5 on The 20 Best Online Bachelor's in Project Management Programs! CSU-Global began offering online degrees in 2007, making it the first and only regionally accredited, independent online state university in the country. CSU-Global operates as part of the Colorado State University system, but maintains significant autonomy. CSU-Global, based in Greenwood Village near Denver, focuses on helping working students achieve the education necessary for career advancement. Instructors deliver classes online in a flexible asynchronous format, allowing students to study whenever they have time. The university offers value as well as convenience, enabling students to complete degrees at a lower cost and in less time than other high-quality educational institutions. CSU-Global offers a bachelor's of science in project management that requires candidates to complete 120 credits, which typically takes four years of full-time study. This degree, aligned with standards set by the Project Management Institute, helps students prepare for the Project Management Professional Certification exam, which is preferred by many employers in the field. Students learn fundamental project management skills including scheduling, risk assessment, and quality control. Candidates can also choose different industry-specific concentrations, such as computer programming, criminal forensics, or healthcare management. Students finish the program by applying learned skills in a project management practicum. CSU-Global normally accepts candidates with 12 or more credit hours of study at other colleges or universities and a GPA of 2.3 or better. In keeping with its commitment to nontraditional students, CSU-Global features generous credit transfer policies. First-time incoming freshmen must provide high school transcripts with a GPA of 3.2 or better and score at least 20 on the ACT or 1000 on the SAT. City University of Seattle ranks #6 on The 20 Best Online Bachelor's in Project Management Programs! CityU, a private nonprofit university headquartered in Seattle, Washington, offers working adults opportunities to earn degrees at 20 physical campuses around the world or online. The university focuses on programs that serve current industry demands and prepare graduates for rewarding career opportunities. CityU supports academic achievement and professional development with learning resource offices and career counseling services. The university delivers most online classes in asynchronous format to maximize convenience for online students. The university's bachelor's of science in project management requires 180 credits of study and takes four years to finish. The degree provides graduates with the skills needed to succeed in professional project management roles. Core project management courses teach scheduling and budgeting skills, risk assessment, and human resources management. This program also includes agility and scrum training, giving graduates instruction in ways to respond to unexpected challenges and opportunities. In addition to core requirements, students take classes focusing on information technology or design their own focus areas. Those that choose the latter option may engage in independent study and work with relevant industrial organizations to develop customized courses of study that suit their individual learning goals. Incoming freshmen without previous college experience apply with high school transcripts or GED. This degree in project management attracts many candidates with previous college credit, and the university maintains liberal credit transfer guidelines. The university also caters to former and current military personnel preparing for civilian careers. CityU grants college credit for military training, and offers veterans and active members of the military reduced tuition rates. Brandman University ranks #7 on The 20 Best Online Bachelor's in Project Management Programs! Brandman, based in Irvine, California, began as a higher educational institution for Marine Corps personnel stationed at the El Toro base. The university now offers more than 80 programs of study to the public. Brandman students can choose to learn online or in physical classrooms in over 25 locations across California and Washington. Online classes, delivered in a convenient asynchronous format, provide flexibility suitable for working professionals. Brandman provides resources to help all students succeed, including academic advisement and career counseling resources. The university's bachelor's of science in computer technology with an emphasis in project management prepares graduates to work in computer and information technology management roles. This program of study requires candidates to earn 120 credits and typically takes four years to complete. Computer technology core classes include programming, security, and networking. All students in the program conduct computer science capstone projects where they apply learned skills. Students then focus on project management issues that relate to technology fields. Candidates learn about structure and resource management, risk management, and organizational change in the context of information technology departments. Brandman accepts candidates with at least 12 credit hours of higher educational study and a GPA of 2.0 or better. However, those without previous college experience may opt to earn the required 12 introductory credits at Brandman, and apply with high school or GED transcripts. As an institution catering to adult students, Brandman maintains clearly articulated credit transfer policies. With a long history of partnership with the armed services, Brandman also offers college credit for military training. Saint Louis University ranks #8 on The 20 Best Online Bachelor's in Project Management Programs! SLU, one of the oldest Catholic universities in the United States, upholds a tradition of Jesuit education that emphasizes critical thinking skills. SLU offers more than 100 degree options at its physical campus in St. Louis, Missouri and online. SLU invests in student success with support resources including academic advising, faculty and peer mentoring, and tutoring. The university encourages innovation, and supports student research efforts. Students pursuing SLU degrees online can study whenever they prefer, as classes follow a convenient asynchronous format. SLU offers a bachelor's of science in project management degree that provides students with the skills needed to oversee complex international projects in large organizational contexts. This program, approved by the Project Management Institute, requires students to complete 120 total credits. The program is offered five terms per year, and allows students to decide how many classes they take per term. Students typically take four years to earn this degree, but accelerated full-time study allows many to finish sooner. Major core classes include data analysis, industry certifications, supplier administration, and risk management. The program includes capstone projects where students demonstrate skills in applied project management settings. Candidates can apply to this project management degree online program through the university's professional studies department. The department accepts applicants aged 22 or older with at least three years of work experience, but makes exceptions in certain cases. Candidates must submit high school or college transcripts that show a GPA of 2.5 or better. SLU caters to adult learners, and allows incoming students to transfer up to 64 credits from other institutions. The university employs designated transfer counselors to help incoming students complete SLU degrees as efficiently as possible. Davenport University ranks #9 on The 20 Best Online Bachelor's in Project Management Programs! DU, founded in 1866 in Grand Rapids, Michigan, now offers more than 50 programs relevant to current and future industry demands. Students can attend classes at DU's campuses throughout Michigan or study online through classes delivered in asynchronous format. The university invests in student success through academic advisement and technology support offices. DU helps students launch careers by maintaining relationships with area business and government organizations, and arranges volunteer and internship opportunities relevant to popular degrees. DU's bachelor's of science in technology project management prepares students to lead teams in technology-based organizations. The degree requires candidates to complete 120 credits, normally in four years of full-time study. Students take classes in advanced mathematics, business fundamentals, and technology. All students in this program take project management core courses that cover risk analysis, project assessment, and leadership. Students then choose to concentrate in accounting, computer information systems, health information management, information security, or networking. Alternatively, students can work with faculty to develop customized courses of study. Incoming freshmen without previous college experience apply with high school transcripts or GED records and ACT or SAT scores. Transfer students must send college or university transcripts. DU holds credit transfer agreements with regional colleges and universities, and works with incoming transfer students to maximize credits applied to DU degrees. The university also offers course credit for military training. As well as helping applicants with scholarships and financial aid, DU offers tuition discounts to select corporate and community partners. Saint Leo University ranks #10 on The 20 Best Online Bachelor's in Project Management Programs! Saint Leo, founded in 1889, preserves its Catholic heritage while preparing graduates for high-demand professional roles. The university now offers undergraduate and graduate degrees in St. Leo, Florida and online. Online classes allow students to study asynchronously, maximizing schedule flexibility. The university offers both online and on-campus students resources to succeed, including professional tutoring, student advisement, and peer mentoring. With lower tuition than most private educational institutions, Saint Leo represents an economical as well as convenient choice in Catholic education. Saint Leo offers a bachelor's of arts in business administration degree with a project management specialization. This online program consists of 120 credits and takes four years to complete. Students learn risk assessment, team leadership, and quality improvement practices that prepare them for executive roles in business settings. This specialized bachelor's degree stands out from other online project management degree programs by encouraging graduates to pursue internships to gain hands-on experience in real business organizations. Faculty members also guide students in accessing other career development resources, such as conferences and professional memberships. Saint Leo's rolling admissions schedule means students can begin their studies at any one of six times throughout the year. Applicants submit a GED, or high school or previous college transcripts. The university only accepts transfer credits from regionally accredited institutions, but transfer students may also opt to seek up to 40 credits by examination. Saint Leo also offers credit for some forms of military and corporate training. The university's designated enrollment counselors help prospective transfer students determine the number of additional credits they need to graduate and how to locate financial aid resources. Southern New Hampshire University ranks among The 20 Best Online Bachelor's in Project Management Programs! SNHU, a private, nonprofit educational institution, maintains physical campuses in Manchester, New Hampshire and Brunswick, Maine. The university also offers more than 200 degrees online. SNHU provides ample student support services, including advising, tutoring, technical support, and career counseling. The university maintains lower tuition costs than similar institutions, making it an affordable option for students seeking online project management degrees. SNHU offers a bachelor's of science business studies in operations and project management degree that prepares graduates for advanced leadership roles in business organizations. This degree requires candidates to complete 120 credits of study and normally takes four years to earn. Classes in this program follow an asynchronous format, so students can learn as their schedules permit. Students develop business core competencies in accounting, finance, law, marketing, and human resources. The program adheres to the Project Management Institute's stringent educational requirements. Project management core classes include supply chains, Six Sigma quality assurance, and the use of spreadsheets in advanced management roles. Students can opt to participate in project management internships or prepare for the Project Management Professional Certification exam. SNHU operates its online classes on a six-term system, which gives students the option to begin their program at any one of six start dates throughout the year. Candidates apply with high school or college transcripts. The university offers prospective transfer students free credit transfer advisement. SNHU allows bachelor's degree students to graduate with a maximum of 60 transfer credits, and accepts credits from classes with a grade of C- or higher. University of the Incarnate Word ranks among The 20 Best Online Bachelor's in Project Management Programs! Founded in 1881 as a Catholic institution to educate women, UIW now offers more than 80 degrees to students on its physical campus in San Antonio, Texas and online. The university promotes student success through advisement, tutoring, and career counseling services. UIW remains committed to its Catholic service-oriented mission, and encourages students to participate in volunteer opportunities that strengthen communities. This mission focus means that the university maintains good relationships with area businesses and government organizations, which facilitates valuable internship opportunities for UIW students. UIW's professional studies department, which holds specialized accreditation from the Accreditation Council for Business Schools and Programs, offers a bachelor's of science in business administration degree with a project management concentration. This online program prepares graduates to work in leadership roles in large organizations. The degree requires 120 credits of study and takes four years to complete. All business administration candidates gain broad knowledge of the business sector through classes in accounting, finance, business law, human resources, taxation, and auditing. Students who choose the project management concentration also learn about personnel management, quality assurance, and organizational behavior. The professional studies department typically requires candidates to have five years of work or educational experience after high school. Applicants must send high school or college transcripts showing a GPA of 2.5 or better. UIW's generous credit transfer policies allow incoming transfer students to gain credit from all courses at accredited institutions in which they achieved grades of C or better. The university may also grant transfer credit for courses at non-accredited institutions if transfer students pass subject-specific exams. 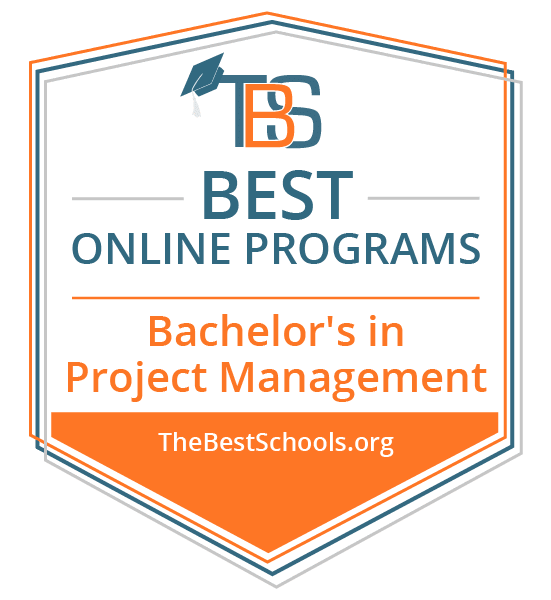 Benedictine University ranks among The 20 Best Online Bachelor's in Project Management Programs! Founded by Benedictine monks in 1887, Benedictine carries on a Catholic academic tradition that emphasizes community service. Benedictine now offers more than 90 undergraduate and graduate degrees. The university, headquartered in Lisle, Illinois, operates satellite campuses throughout the state and in Mesa, Arizona. Benedictine also offers many degrees online in an asynchronous format, meaning students can study whenever they like. The university provides academic and financial aid advisement and career counseling services to all its students. Benedictine's online bachelor's of art in management degree allows students to choose a project management focus. This track trains business professionals to be able to plan, execute, and assess complex projects while adhering to strict budgetary limits. All students working towards the management degree learn about core business practices, such as accounting, economics, marketing, organizational behavior, and statistics. Those opting to focus on project management also receive instruction in risk assessment, budgeting, quality control, and project assessment. Students must complete 120 credits to graduate, and typically finish the course of study in two to four years at Benedictine, depending on the number of transfer credits they apply towards the degree. Prospective students apply with high school or previous college transcripts. Benedictine typically only accepts candidates aged 22 or older into its online programs. The university allows transfer students to bring up to 90 credits from other accredited higher educational institutions. Candidates may earn up to 18 credits for work experience. Benedictine grants credits for certain types of military training and offers active service members and their spouses 10% tuition discounts. Bellevue University ranks among The 20 Best Online Bachelor's in Project Management Programs! Founded in 1966, Bellevue offers more than 80 degrees at its main campus in Bellevue, Nebraska and online. The university's online degrees, delivered in asynchronous format, allow students to attend classes whenever they prefer. Focused on emerging economic trends and responsive to employer demands for skilled workers, Bellevue delivers programs of study that help graduates thrive in changing job markets. Bellevue invests in student success with academic advisement, tutoring support, and career services. Bellevue offers a bachelor's of science project management degree that teaches leadership skills and planning strategies needed in business settings. This program, endorsed by the Project Management Institute, requires candidates to earn 127 credits. The degree, intended for candidates with two years of previous college experience, can be completed in two years at Bellevue. Major core courses cover leadership, communication, cost analysis, and quality control. All students complete applied capstone projects. Student teams then develop and present analyses of their projects to peers in a final major course. Students must also complete courses covering issues related to American heritage and good citizenship. This degree, typically only open to candidates with previous higher educational experience, requires applicants to hold associate degrees or provide transcripts showing at least 60 undergraduate credits with grades of C- or better. Bellevue maintains articulation agreements with many higher educational institutions around the country, making credit transfer easy to facilitate for incoming transfer students. The university also offers credit for workplace training and life experience through a free online course that helps prospective students compile portfolios that transfer specialists then use to make transfer credit determinations. Minnesota State University Moorhead ranks among The 20 Best Online Bachelor's in Project Management Programs! Founded in 1885, Moorhead continues its mission of strengthening communities by improving lives through education. The university, located in Moorhead, just over the state line from Fargo, North Dakota, offers 74 degrees in fields relevant to high-growth careers. Both a small college and part of the wide-reaching and diverse Minnesota State Colleges and Universities system, Moorhead gives students access to world-class educational resources and personalized support. Moorhead now offers many online programs that allow transfer students with previous associate degrees or general study college credits to earn specialized bachelor's degrees. Moorhead's bachelor's of science in project management allows candidates who completed general education requirements elsewhere to finish their undergraduate degrees. This program requires students to earn 54 credits in major core classes focusing on project management and related topics. Project management students learn about economics, statistics, accounting, cost analysis, and scheduling in accordance with standards set by the Project Management Institute. Candidates complete capstone courses in which they launch live projects or analyze historically significant projects. Transfer students with enough credits from other institutions can complete this course in less than two years. Students interested in transferring into this program at Moorhead must send transcripts proving least 24 earned college credits with a GPA of 2.0 or better. The university accepts credits from other regionally accredited institutions and maintains transfer relationships with many nationally accredited community college. Transfer students with associate degrees can opt to waive Moorhead's standard liberal arts requirements, and begin their studies with major core classes. Columbia Basin College ranks among The 20 Best Online Bachelor's in Project Management Programs! CBC, founded in 1955 and located in Pasco, Washington, grants degrees that help graduates launch careers in rewarding specializations. CBC primarily serves the workforce preparation needs of citizens in Benton and Franklin Counties, and now offers many online degrees to students outside the college's traditional service area. The college invests in student success with dedicated support services including online tutoring, career counseling, and academic advising. CBC maintains low tuition rates, especially for Washington residents, making the college an economical option for students. CBC's bachelor's of applied science in project management, intended for transfer students who already hold an associate degree or have completed general education courses, requires candidates to earn 64 credits. The three-year program incorporates theoretical and hands-on training in the skills needed in business project management roles. The degree follows rigorous professional standards set by the Project Management Institute. Students learn to use project management software packages including Microsoft Project and Primavera, and cover specialized topics such as risk assessment, procurement, and project analysis. Students also complete capstone projects where they demonstrate competency in applying learned skills. Candidates may also participate in internship programs, gaining project experience in business settings. Since this project management degree caters to transfer students with associate degrees or equivalent general education credits from other accredited institutions, candidates apply with transcripts from previously attended higher educational institutions, and all degree-seeking applicants must take placement tests. CBC operates on the quarter system, and candidates can apply and begin studying at the college any quarter of the year. Wentworth Institute of Technology ranks among The 20 Best Online Bachelor's in Project Management Programs! Operating in Boston, Massachusetts since 1904, WIT grants degrees in business, design, and technology that help graduates succeed in professional roles. WIT now offers many courses of study in hybrid and online formats. WIT supports its students with academic and financial aid advising services and peer tutoring programs. The institute encourages creativity through collaboration, and courses emphasize group problem-solving skills as much as theory-based knowledge. WIT's bachelor's of science in project management, an online program following competency standards set by the Project Management Institute, provides students with the skills they need to pursue business leadership roles. This bachelor's degree enjoys program-specific accreditation from the International Assembly for Collegiate Business Education. The degree requires candidates to complete 128 credits of study, and takes three to four years to complete. Major core classes cover communication, leadership, scheduling, marketing, and quality control topics relevant to typical project management career paths. In the program's final year, students participate in intensive capstone courses where they apply knowledge to planning, executing, and assessing projects. This program typically admits applicants 22 years of age or older with at least three years of work experience. Students without college experience apply with high school transcripts and ACT or SAT scores. Those who began their higher educational careers elsewhere apply with college transcripts. Applicants must show a GPA of 3.0 or better. WIT maintains generous credit transfer policies, and candidates can seek credit for professional experience by taking specialized exams or creating portfolios describing why credit should be granted. Charleston Southern University ranks among The 20 Best Online Bachelor's in Project Management Programs! Founded in 1955, CSU offers more than 80 undergraduate and graduate degrees at its campus in Charleston, South Carolina and online. A Baptist university, CSU maintains its mission of delivering liberal arts instruction to encourage strong critical thinking and communication skills. CSU helps students succeed through the university's learning center, which provides on-demand academic tutoring and writing support services. CSU encourages all students to participate in the university community through clubs, service organizations, and campus ministries. The university also maintains affiliations with relevant professional organizations, and helps students access the educational and career development resources these organizations offer. CSU's bachelor's of science degree in project management prepares graduates to thrive in workplace leadership roles. Offered through the university's professional studies department, this degree requires 125 credits of asynchronous online study to complete, which usually takes four years or less. Core courses cover accounting, business law, economics, statistics, cost estimation, and risk assessment. The degree also introduces students to issues specific to international project management, which many degrees in project management do not. The department requires prospective students with fewer than 24 credit hours of college study experience to provide high school transcripts and ACT or SAT scores. Applicants must have a GPA of 2.0 or better. Candidates typically apply with transcripts from previously attended higher educational institutions, and may transfer up to 68 credits to towards their CSU degrees. Some candidates must take math placement tests upon acceptance. CSU grants college credit for specialized subject exams, military training, and some forms of professional licensure. Seminole State College of Florida ranks among The 20 Best Online Bachelor's in Project Management Programs! Founded in 1966, Seminole provides higher educational options to central Florida residents at its main campus in Sanford and satellite campuses in Altamonte Springs, Heathrow, and Oviedo. The college now offers many programs online as well, allowing students outside its traditional service area to earn respected Seminole degrees. The college strives to fulfill its mission of enhancing regional economic growth through exemplary instruction, and invests in student achievement with math, science, and writing tutoring services. Seminole maintains low tuition rates and remains an affordable alternative to other public institutions in the state. Seminole's bachelor's of science in construction program allows candidates to specialize in project management. This focus prepares graduates for leadership roles in building trades industries. The program's coursework provides candidates with associate degrees in construction or related subjects opportunities to gain enhanced expertise in the construction field. Catering to working professionals, this online project management degree takes three years of part-time study to complete. Students learn about estimates, specifications, organizational management, risk assessment, and quality control. The program requires candidates to complete capstone courses in which they apply learned skills to the development and management of simulated construction projects. Prospective students apply to this program with college transcripts showing completion of associate degrees in subjects related to construction. Seminole's registrars evaluate transcripts for transfer credits which may apply towards general education requirements, allowing many incoming students to complete the degree in less time than the normal three years. Credit may also be earned through alternative means, including specialized exams, military training, and industry certifications. Baker College ranks among The 20 Best Online Bachelor's in Project Management Programs! Founded in 1888, Baker has been preparing students to succeed in rewarding careers for over 100 years. Based in Flint, the college offers undergraduate and graduate degrees on its campuses throughout Michigan and online. The college delivers online classes asynchronously, so students can study whenever they prefer. Baker offers tutoring and test preparation services to support academic success. Baker also helps connect graduates with jobs in their fields through its career services department, which enjoys mutually beneficial relationships with top employers in Michigan. Baker offers a bachelor's of science in information services degree with a concentration in project management that prepares students for information technology leadership roles. The degree requires 120 credits to graduate, which normally takes four years of full-time study. Major courses teach accounting, programing languages including C++ and Java, statistical methods, and legal and ethical issues related to technology. Students opting to concentrate in project management learn to initiate, plan, execute, control, and assess complex networking and information technology projects. Students complete their studies with embedded experiences working in real information technology jobs. Graduates are equipped with the skills needed to manage and improve large information technology departments in corporate settings. Candidates interested in this specialized program apply with high school or college transcripts. Baker does not require ACT or SAT scores, but applicants may include them if they prefer. Baker accepts incoming transfer credits from many institutions based on earned grades and relevance to the student's program of study, and enrollment coordinators help applicants understand credit transfer options. Because project management is a diverse field, bachelor's programs in project management have different course offerings and degree requirements. However, every project management program develops students' leadership, management, and critical thinking skills. Online project management degree programs allow students flexibility in when and where they complete coursework, and students can customize their degree with concentrations such as business administration, organizational leadership, and healthcare management. Coursework in project management programs emphasizes skills in all facets of management. Courses cover topics such as operations management, project and contract procurement, risk management, and leadership. Many programs offer curricula aligning with the Project Management Institute's Body of Knowledge standards; these programs prepare graduates to earn their Project Management Professional certification. Some students earning a project management online degree may focus on technology and related skills to prepare for careers in tech-driven industries. Each project management program has different graduation requirements. Students may take a capstone seminar, complete a senior project, or participate in a mentor-supervised internship. Before choosing a program, ensure the requirements fit your goals and lifestyle. Because project management degrees provide an array of marketable skills, graduates enter careers across industries. Project management professionals are strong leaders and proficient multitaskers. The careers below are a few examples of options for graduates with a project management degree. Human resources managers: These managers oversee an organization's staffing. They often serve as a connection between employees and management. Human resources managers may also manage an organization's administrative duties, and they exist in nearly every industry. Architectural and engineering managers: Many project management professionals oversee projects in architectural and engineering firms. They plan and direct various types of projects and work in settings such as offices, job sites, and production plants. Construction managers: Construction managers supervise the various aspects of construction projects, including managing construction staff and implementing plans made by architects and engineers. They often create and manage project budgets and make sure projects stay on schedule.